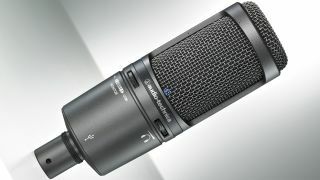 MUSIKMESSE 2013 PRESS RELEASE: Audio-Technica is to show its new AT2020USB+ Cardioid Condenser Microphone - the successor to its popular, easy-to-use AT2020USB model - at Prolight+Sound, Musikmesse's companion show. Equipped with a USB output, the microphone is designed for digitally capturing music or any acoustic audio source employing users´ favourite recording software. The AT2020USB+ offers studio-quality articulation and intelligibility perfect for home studio recording, field recording, podcasting and voiceover use. The AT2020USB+ features a built-in headphone jack with volume control that allows users to directly monitor their microphone signal in real time, and a built-in high-output internal headphone amplifier that delivers superior clarity. The microphone also offers a mix control that can blend the microphone´s signal with pre-recorded audio (perfect for DJ/karaoke use). The unit´s cardioid pickup pattern delivers excellent off-axis rejection, while its A/D converter - with a 16-bit 44.1/48 kHz sampling rate - ensures extremely articulate sound reproduction. The AT2020USB+ has a recommended retail price of £169 inc VAT/€169 ex VAT and will be available from April 2013.